Bright blue Chrysocolla on the tips of Malachite . Fans of black matallic Goethite forming a very aesthetic specimen. There is a small orange crystal of Onegite on the fans. These are becoming very hard to find in free standing sprays such as this. most of the specimens you see are a jumble of coated crystals. Beautiful small cabinet specimen of orange Quartz from a long ago find. In good shape as you can see. A bed of crystaline blue Linarite host equally striking radiating tufts of green needles of Brochantite. Orange red crystals of Wulfenite on matrix. The color is reminescent of early red cloud specimens. outer crystal adding a pleasing color change. A light blue Pseudomorph of Chrysocolla after Azurite. Most of the crystals are terminated. Wonderful specimen. The spot on the side of the crystal iss from contact of a now gone crystal. yellow surface that you want to see in a top quality Mimetite. One of the newer things from China was recently discussed in the show reports in the recent Mineralogical record. Chalcopyrite coating elongated crystals of Chalcocite with the rounded masses being Djurleite coated with Chalcopyrite. This specimen ranges from Blue, purple, gold to red. Very iredescent specimen. 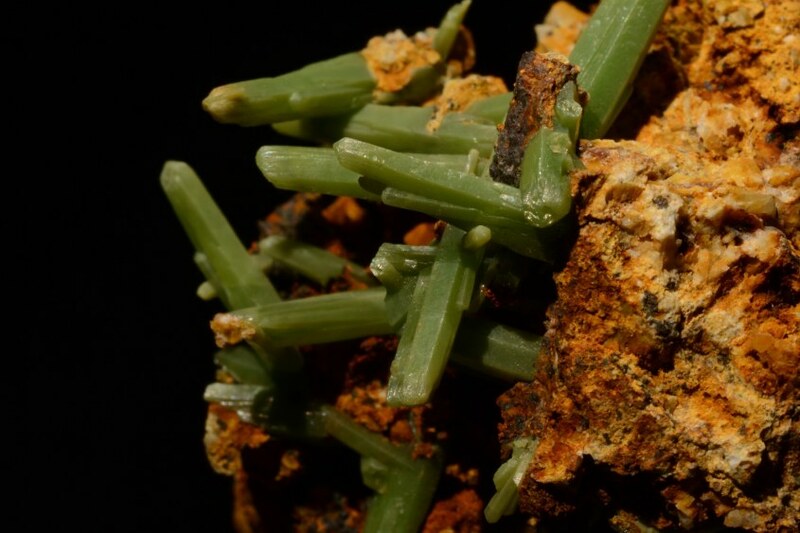 Long prismatic crystals of grass green Pyromorphite. Something different from a mine that has been so prolific. Feathery sprays of Aragonite on matrix. The crystals in the center of the specimens are colored an orange by hemetite. which Malachite and Azurite have grown. Inky blue gemmy crystals of Lazulite on matrix with striated crystals of Quartz and tan Siderite. of each crystal that gave the upper half of the crystals an orange color. Awesome two toned Hemimorphite specimen. A real show stopper. Water clear Japan law twin Quartz on a matrix of Quartz. Two of the lesser Quartz crystals are included by Hematite giving them an orange color. No Damage. Sweet little thumber. "sparkly" matrix of what appears to be Copper. Museum size Quartz specimen with epitaxy Quartz off the main crystal. Also on the Quartz matrix is a parallel growth twin. and almost never on matrix. Beautiful specimen that comes on a custom lucite base. No damage. Mirror luster silver tabs of Hematite on the face of two larger crystals. Hard to photograph. Barrel shaped crystals of orange Vanadenite crystals on a dark matrix. Fantastic orange transparent crystal on Wulfenite with crystals attached to the face. There is also some Mimetite on the matrix attached to the crystal. Electric lime green acicular crystals of Cuprosklodowskite with Torbernite. Not the typical small vug in a larger specimen but a matrix covered in the lime green crystals. Torbenite can also be seen on the back of the specimen. Cuprosklodowskite is a radioactive mineral but handled safely poses no risk. Mesolite impaling Calcite crystals on Thompsonite from Oregon. A wonderful yet super fragile specimen. Hand deliver only.